I've firmed up my lesson plan for this week and I'm only going to teach the chorus to Choose the Right. I'm using a combination of ideas from Pat Graham's workshop and some I found from Yahoo Groups. If you don't have the Gospel Art Book, you can find similar pictures using the Gospel Art Kit (aka GAK) pictures (I didn't realize there was a difference??) which are featured online HERE. You can also try to find 3 pictures at the library of children choosing the right. If you use different pictures, adjust your activity accordingly. **Note, the Gospel Art Book comes in a spiral bound book. I have taken it all apart and placed all the pictures in plastic cover sheets. It's much more versatile this way! See how I've done it HERE. You choose to say your morning prayer (hold up GAB picture 111 & hang on chalk board). You choose to pay your tithing (hold up GAB picture 113/114 and hang on chalkboard). You choose to be reverent during the Sacrament (hold up GAB picture 108 & hang on chalkboard). Choosing to do the right is not always easy, but we receive blessings when we try. Sing the chorus and have the kids raise their sticks when "choose the right" is sung. You point to each picture as the phrase is sung as well (these 3 pictures represent the phrase "choose the right" each time it's sung in the chorus). Hang keywords out of order on the chalkboard. 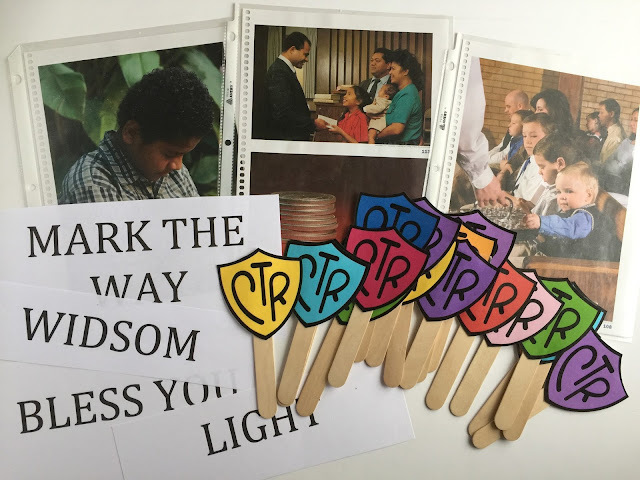 Pick children at random to help place words in order as you sing until correct (keep raising the CTR sticks when you sing “choose the right” too). The words will be placed between the GAB pictures so hang the GAB pictures accordingly. Since Jr. Primary can’t read, I’ll pick a card, tell them the word and they will have to help me place it in order. Sign “Evermore” (This word is in Beautiful Savior in ASL on the church's music website HERE. It's the last word of that song too). Pass sticks to the person on the right when you sing "right"
Download my lesson plan to-go HERE. Testimony: I am glad that Heavenly Father gave us agency to make choices, and the Holy Spirit to help us choose the right. Find my lesson plan to teach the verses HERE. This is amazing, Camille - you are a gem! I will be using this whole plan for my singing time tomorrow, have just made the little CTR sticks using your printout and they look great! Thanks so much! Thank you so much for sharing your ideas. It really helped me get a better idea of how I'm going to teach this. THANK YOU!! Thank you for this! I totally used this yesterday. In the coming weeks- I also want to wrap two packages one will have pictures or something of 'right' choices and one will have pictures of 'wrong' choices in life. I am thinking to wrap them so they look identical so its harder to choose right- helping to represent that it is sometimes hard to choose right. Just to help you with your idea (I want to do something similar but I'm kind of stuck), there is a CTR game in the friend on page 41(?). It's sort of a memory game - 10 pairs of pictures all relating to choosing the right. I don't know if that can help you or not. I may post something on this...I'm still putting together my thoughts!! Thanks for the suggestion for the CTR game from the friend. I printed them out, cut them apart and put the good things in one box, the bad choices in another box. I will wrap the boxes exact and ask them to choose the right one. Hope it works as planned- most likely i will have 2 kids come and open them together and see which one is right. Thank you so much for sharing so generously! You're awesome! Thank you for sharing! You put so much thought into this and I love everything you put out. I'd like to believe that we think alike since we're cousins. I'm now the ward chorister and stake primary music leader. Thank you so much for all of your great ideas and help. I just noticed that your word strip for wisdom was spelled "widsom." Thank you! I'd fix it right now but my computer has gone into repair until monday...dang it! I hate typos. Thank you very much. Your information and ideas are priceless. Thank you thank you. I'm just finding your blog / posts. I'm a newly called chorister and love all your ideas. Thanks so much for leaving them up for us newbies. Bless you!! !